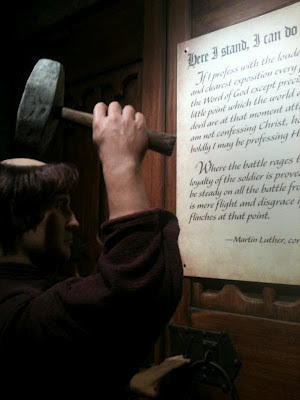 Beggars All: Reformation And Apologetics: The Creation Museum and Luther: Oops. The Creation Museum and Luther: Oops. As far as I know, there isn't any proof Luther actually said this. I wonder who did say it. I like this statement and would like to give proper attribution. Try Luther Works. Weimar Edition. Briefwechsel [Correspondence], vol. 3, pp. 81f. Courtesy of Wayne Sparkman of the PCA Historical Center at a discussion over at Green Baggins a while back. Oops. Looks like the Apocryphal Luther shot that one down. But I take it this is the same place RPV mentions above.